We use your Personal Information for providing and improving our Customer Service. You know by using our website, you agree to the collection and use of information on our website and in accordance with this policy. While you are using our Website or Service, we may ask you to provide us with certain personal information that can be used to contact you, regarding our service. Your Personal identifiable information may include but is not limited to, your name, phone number, and your location (“Personal Information”). We collect information your browser sends whenever you visit our Website (“Log Data”). This is a standard internet protocol when you visit any website, and we have no control over collecting this type of information. Perhaps, you’ve heard the name cookies. Cookies are files with small amount of data, which may include an anonymous unique identifier. Whenever you are visiting a website, this website sends cookies to your browser. The cookies are stored on your computer’s hard drive. We use “cookies” to collect information. You can set up your browser to refuse all cookies or to indicate when a cookie is being sent. However, if you do not accept cookies, you may not be able to use some portions of features on our Service. In this case, we apologize for the inconvenience. We do not employ third party companies and subcontractors to facilitate our Service, to provide the Service on our behalf. 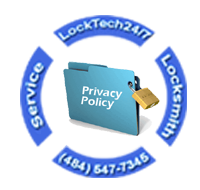 Our locksmiths perform all of our professional locksmith services, assisting us in analyzing how to serve you better. We concern about your privacy because we care about you. Your Personal Information stays within the paperwork of our office, only. With this in mind, you must realize that there is no method of transmission over the Internet, or method of electronic storage isn’t 100% secured. Offering our locksmith services, we do not address anyone under the age of 13 (“Children”). We do provide a service to children while speaking to one of the parents over the phone. Needless to say that we verify all the details before we perform any work.